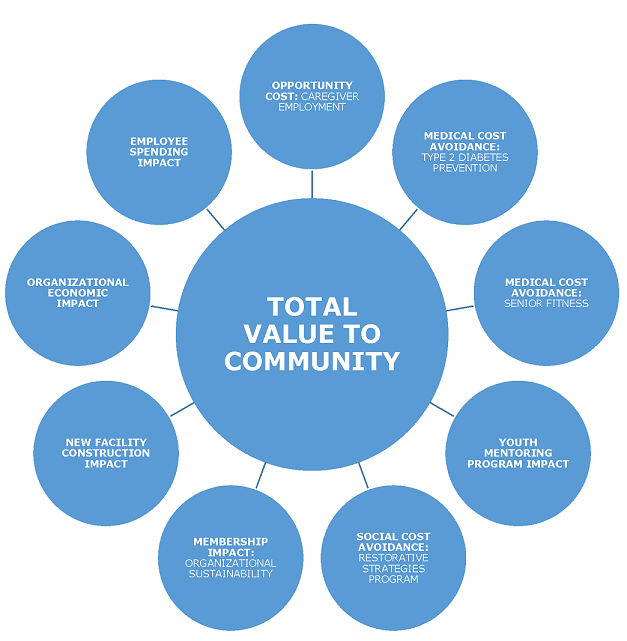 The Total Value graphic illustrates the wide range of values delivered by the Dubuque Community YMCA/YWCA. Beyond the obvious wellness support and education of member participants, Dubuque Y offers tangible value in a variety of ways. With the new and expanded facility, new values are also created. This graphic represents each of these areas, and they are explained in more detail in this report. In Dubuque County, there is a shortage of licensed childcare facilities, which results in a number of families on wait-lists. The new facility will meet a need in the community for qualified childcare by expanding its infant, toddler, and afterschool care program capacity. The new facility is expected to increase the infant care capacity by 20 children, the toddler care capacity by 20 children, and the afterschool care capacity by 70 children. This increased capacity makes it possible for more caregivers to return to the workforce. Currently, the Center for Disease Control (CDC) estimates that 5.4% of the population in Iowa is pre-diabetic. The Dubuque Y estimates the population of the City of Dubuque at approximately 59,000. Given these figures, the estimated number of local pre-diabetic individuals is 3,186. The new facility’s increase in space is expected to increase the Diabetes Prevention Program’s capacity. Participants in the program do not need to be YMCA/YWCA members. For every 100 program participants age 60 and under, the annual medical cost savings to Dubuque tax payers is estimated at $449,094 and $2,245,470 over 5 years. For every 100 program participants over age 60, the annual medical cost savings to Dubuque tax payers increases to an estimated $549,753 and $2,748,765 over 5 years. In 2017, DCY launched an Enhance Fitness program specifically targeted to help older adults become more active, prevent falling, become more energized, and empower for independent living. The new facility will allow the organization to expand the program to more senior citizens. If the Enhance Fitness Program results in just 10 prevented falls per year, the estimated medical costs avoided for Dubuque tax payers amount to $300,000. Over five years, the estimated fall related medical costs avoided amount to $1,500,000. Reach and Rise is a therapeutic mentoring program for youth ages 6 to 17 who lack role models and live in communities challenged by poverty, crime, substance abuse, gangs, single-parent households, and other social issues. Using DCY’s current youth enrollment in the Reach and Rise program, the long-term monetary benefits (at net present value) of program participation are estimated between $13,680,000 and $32,976,000. DCY’s Restorative Strategies program is a philosophical framework that is an alternative to the current way of thinking about crime and criminal justice, as it applies to youth. The main objective of the program is to keep kids out of the criminal justice system. DCY is the only local organization addressing the social justice issues that pertain to youth in the community. The program works with students from the community’s three middle schools (student population of 2,380), their principals, guidance counselors, law enforcement, and the court system. Inception to date, the program has reached out to over 360 children. The new facility will provide a dedicated multi-purpose space for the Social Justice Center. The new dedicated space will provide a more stable setting for program initiatives and a private space for mediation sessions. The current membership units at the existing facility as of 10/31/2017 are 1,960 with associated membership unit revenue of $814,461. In five years, the estimated membership units (per the DCY's 5-year budget) at the new facility grow to 2,893 with associated membership units of 933 and membership unit revenue of $617,937 contribute to the organization's financial health and sustainability. Construction expenditures, like any other activity that involves an economic transaction, also have an economic impact greater than the original dollars expended. This direct investment of $20,000,000 will have a one-time direct and indirect impact of $30,477,600 on the area. The Dubuque Community YMCA/YWCA impacts the area just as any other business entity that employs people and purchases goods and services. Each dollar paid in earnings to employees is spent for living expenses, rent, food, etc., at businesses which also have employees, who then spend their earnings on other goods and services, and so on. This is often referred to as the ripple effect. The total expenditures of the organization can also be used to estimate their total economic impact. The current annual total operational spending of $1,354,334 per year is estimated to create $1,823,881 worth of commerce (final demand) in the area. The estimated post-construction annual total operational spending of $1,800,227 per year is estimated to create $2,424,365 worth of commerce (final demand) in the area. As the wages paid by DCY are circulated throughout the area, their impact becomes substantially larger. The estimated current annual payroll of $2,046,213 per year is estimated to have a $3,487,361 annual earnings impact. The estimated post-construction annual payroll of $2,259,184 per year is estimated to have a $3,850,328 annual earnings impact. In other words, each dollar the organization pays in salary causes an additional $.7043 in earnings to be generated in the community. Each job at the DCY has the effect of influencing the need for other jobs at area businesses. The organization’s estimated current equivalent of 84 people is estimated to stimulate the need for 26 additional jobs in the area. 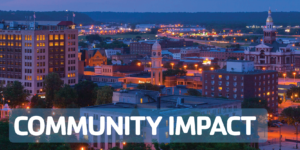 The Dubuque Y impacts the area just as any other business entity that employs people and purchases goods and services. Each dollar paid in earnings to employees is spent for living expenses, rent, food, etc., at businesses which also have employees, who then spend their earnings on other goods and services, and so on.